Adult bed rails are excellent bedroom safety aids that can prevent bedridden individuals from falling or rolling out of their beds. They are also great options for elderly adults who experience mobility challenges and difficulty getting in and out of bed. 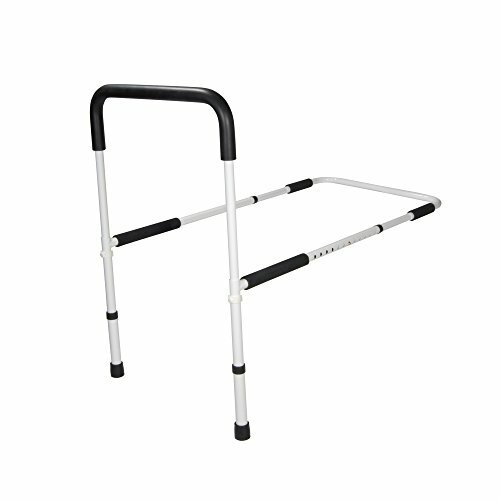 They provide a sturdy grip that helps you or a loved one get in and out of their beds. Bedroom safety is often an overlooked safety and risk factor for seniors, so it is wise to consider some preventative safety aids that can also improve their quality of life. Let's take a look at some of our favorite bed rails. This bed rail has garnered solid praise, particularly for its ease of assembly- it is composed of three easy-to-assemble pieces. It has a no-slip foam on its base for increased stability. For users who are having difficulties in getting up from bed, the sturdy handle that slides under the mattress will prove to be of great help. 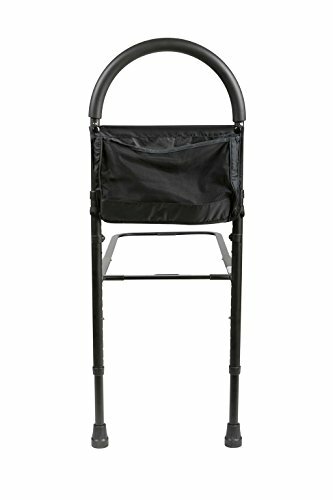 This product has a weight capacity of 250 lbs. The rail dimension is 32.75″(D) and 19.75″(W) while the height can be adjusted from 13.5 to 16.5 inches. This rail is foldable, lightweight and portable. The only drawback to this rail is that the bed’s platform must be at least 16 inches from the ground according to reviews. It will not work on low profile beds. For people who are having trouble getting out of bed, this product is highly recommended. 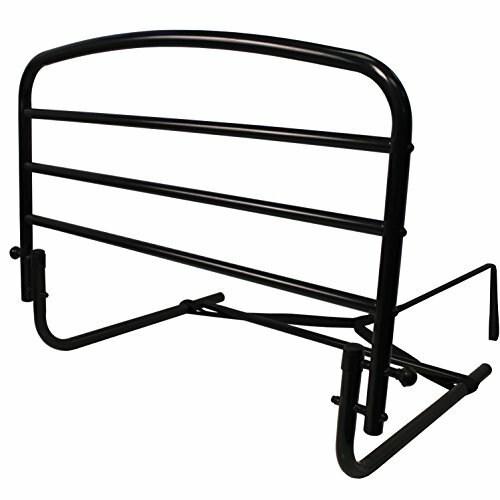 Manufactured in the US using steel, this bed rail has a strong and sturdy construction. Setting it up can be done in minutes without tools. Many users appreciate that it fits most heights and sizes of beds up to queen size. An additional ergonomic feature of this product is the 13” x 9” nylon pocket. It also comes with safety straps for wrapping around the mattress for more stability. This easy-to-assemble rail attaches to most types of beds. To keep it in place, it comes with a safety strap for wrapping around the bed. Once installed, the height can be adjusted from 26 to 34 and 42 inches. The rail functions as both bed rail to prevent a person from falling during sleep and as a handrail for easy getting out of bed. This rail has a maximum weight capacity of 300 lbs. Added features include a 6-pocket organizer to keep handy items close by. Avoid falling out of bed with this ergonomic bed rail. 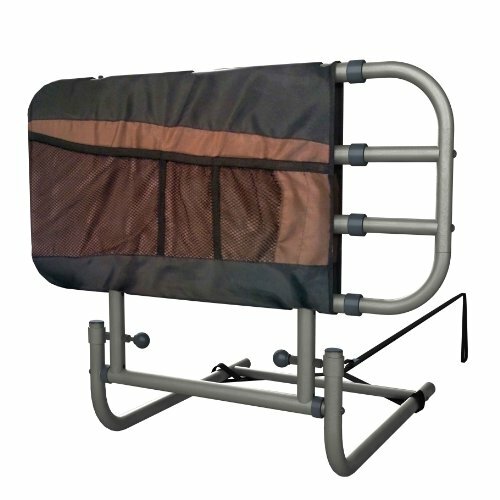 This 30-inch bed rail is collapsible and is easy to store and assemble. It can be used with any hospital and home bed. A safety strap is included in the set to prevent slipping. This rail also functions as a support structure for getting out of bed. The rail measures 20” wide with adjustable height from 17″ to 21″ and can be installed on either side of the bed. When you buy this item, it also comes with a padded storage pouch. Some users noted that the bed should have a clearance of at least 15 inches from the ground for it to work. For people who keep on falling from bed in their sleep, this bed rail is an effective solution. It also provides added body support for people who are having difficulty in getting up. This item can be installed in most types of beds. It stays in place and extends 3 inches under the mattress while being also supported with non-slip sleeves. Its capacity is limited to 300 pounds. It is easy to install and is also portable as it fits in large suitcases. It is important to consider the length of the bed rail when browsing for options. Bed rails are available in half-length, full length or shorter. As well, adjustable rails will lengthen and frequently make for the most convenient alternative. Consider purchasing a tray table if your loved one has difficulty getting to the dinner table. A tray table can make it easier to serve meals bedside. Sometimes it’s necessary to have bed rails on either side of the bed, as opposed to just one side. This provides additional security, truly preventing any unfortunate falls from out of a bed- preventing bedroom injuries. It is definitely important to take some initial measurements prior to purchase. While most bed rails will accommodate your average sized mattress, whether it is a queen or a king sized bed, it’s always better to be safe than sorry. Measure twice, cut once, they say. The spring-loaded releases of safety bed rails enables easy and simplified adjustments. Many bed rails are designed to be collapsible which means that they can be easily moved out of the way once the individual is out of bed. Getting a bed rail is only half the battle, sometimes. It’s important that the mattress you are using with the bed rail is in decent condition. If the mattress in question is worn out, lumpy and just generally in disrepair, it is not a good idea to use a bed rail. There are some other useful accessories you might consider purchasing along with the bed rail, these include bolster pads for roll prevention and rail gap wedges that provide for additional safety and fall security. There are also full-sized protection pads that can be aligned alongside the bed as a secondary defense against falls. There are also some bedroom comfort accessories that many people choose to purchase to increase the comfort they or a loved one experience while in bed. Often times, if you or a loved one is spending a considerable amount of time in a bed, it makes sense to examine some bedroom comfort options that can enhance quality of life. These include various types of cushions, like foam pads, knee wedges and other types of positioning aids. If you are in the market for one of these bedroom aids, take a moment to consider some of the following questions prior to making a purchase. Should the rail be one or two sided? Will the user be able to get in and out of bed themselves, or is a caregiver going to be helping with that? 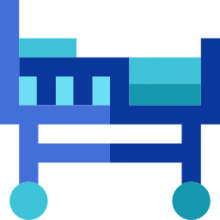 If you are purchasing a bed rail that will be used in a hospital environment or an assisted living facility, call ahead and make sure that it is a fit with the mattresses they use in the medical center. If an individual is suffering from dementia, it’s possible that a bed rail might not be the best option for them because they sometimes try to clamber over the rails which can be very dangerous for them. If you are a caregiver, your natural instinct is to protect your aging relatives from injury while also helping them to maintain as much autonomy as possible. Preserving the quality of their life should be the primary focus of your elderly care plan. 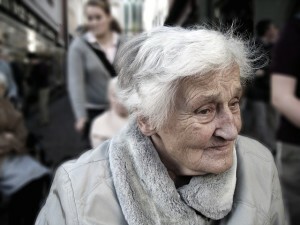 If you are helping them age in place, which is to say allow them to live in their residence as they age, one of the best ways of ensuring that they can stay in their home for as long as possible is to make modifications to the residence to minimize common hazards and maximize accommodations. This is true whether they are living on their own, or under your supervision, or they are being cared for in home by a healthcare service professional. When you think about the areas of the home that most typically pose danger to the health and safety of your elderly loved one, you may think of steep stairs, an iced over walkway or a slippery bathtub. However, the bedroom is the first and last place your elderly relative is during the day, and they also spend the most time in the bedroom, most likely. A few simple changes will help to ensure that their bedroom is as comfortable, safe and secure as possible. The first thing is to eliminate electric blankets and heating pads. These heating devices can cause very severe burns very quickly. They also pose a fire hazard. As an alternative you can try microwaving a pillowcase that is filled with rice and sewn shut- this can be inserted into the bed in lieu of an electric blanket. Secondly– consider purchasing a commode chair- many elderly individuals are hurt when they get up late at night to go to the bathroom and subsequently fall. It’s hard to see at night and this in conjunction with their limited mobility creates a high risk of falls. Add one of these commode seats to the bedroom to ensure that your elderly relative can access the toilet without having to travel too far through the night. 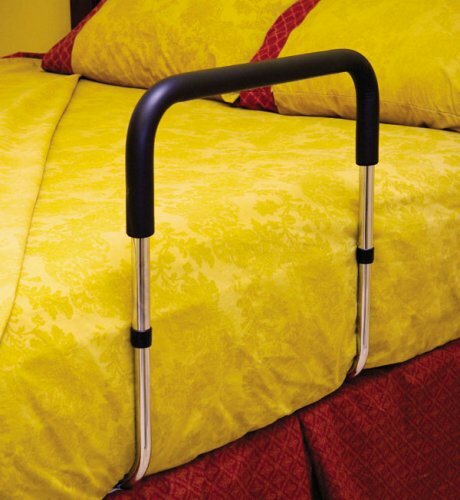 Finally, bed rails or bed ramps can help elderly individuals get in and out of bed more easily. This will help to minimize falls and in general increase their ease of life as they age. If you follow these tips and strategies, you will help to ensure that the senior in your life has a safety-approved bedroom that positions them to age in place for as long as they are able.